Former Indian President Pranab Mukherjee addressed the closing ceremony of the 'Tritiya Varsha Sangh Shiksha Varg', a Rashtriya Swayamsevak Sangh (RSS) event, on June 7 in Nagpur, India to mark the conclusion of a three-year training camp for swayamsevaks there. Mr. Mukherjee's decision to address thousands of RSS volunteers has been a very controversial one and was questioned and bemoaned by the Congress as a political gift to its opponent, the BJP, the fascist Hindutvadi party that now rules India, at a time when the country is being landscaped for the next general election. They had a valid ground. After all, the nearly 100 year old organization, RSS, which drew inspiration from Mussolini’s Italy and Hitler’s Germany has a history of twisting facts with half-truths since the days of Gandhi when the latter visited RSS camps in 1934. 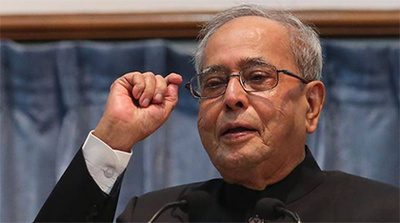 However, Mukherjee, the veteran Congress leader, stood his ground and delivered a sharp defense of India’s pluralism and secularism, and called on the RSS workers to shun violence or hatred. India’s history since gaining her independence on August 15, 1947 from the Great Britain has been a checkered one, punctuated by a series of high-level murders, starting with the murder of its most notable figure, Mohandas Gandhi who was gunned down in 1948 by a RSS Hindu fanatic - Nathuram Godse. Two prime ministers – Indira Gandhi and her son Rajiv Gandhi were slain by radicalized Sikh bodyguards in 1984 and a Tamil suicide bomber in 1991, respectively. The country has also fought communist/Naxalite insurgencies in the east and separatist movements in the north-west and north-east frontier territories. India has made it to the Guinness book of world records for huge deployment of her armed security forces in the Occupied Jammu & Kashmir as Kashmir is the only place with the highest ratio of security to people. There are an estimated 700,000 security forces for a population of 12 million. It is not a small number: 1-soldier to 17-Kashmiri civilians. Kashmiris continue to complain bitterly about the heavy security presence, and tensions have risen in the past as Indian forces have repeatedly fired on rock-throwing youths and peaceful protesters, raped women in villages and towns and burnt and damaged property worth millions of dollars. Seemingly, India had read the writings on the wall and understood that the resistance of the freedom-loving Kashmiris can’t be tackled by merely corrupting the politicians, and thus, has relied on heavy armed forces deployment to kill the resistance movement and force the Kashmiris to feel that they are part of India. With the daily lynching of Muslims in many parts of India, and Muslim and Christian houses of worships threatened by re-energized Hindutvadi fascists, the speech of Mr. Mukherjee could not have come at a more appropriate time. Mr. Mukherjee started his speech discussing the concepts of Nation, Nationalism and Patriotism in the context of India, that is Bharat. Using the dictionary meaning of the terms, he said that "nation is defined as 'a large group of people sharing the same culture, language or history and inhabiting a particular state or area'. Nationalism is defined as 'identification with one's own nation and support for its interests especially to the exclusion of interests of other nations'. Patriotism is defined as 'devotion to and vigorous support for one's country'." It won't require too much digging into history to state categorically that there never has been a single Indian nation, but many nations with their linguistic, cultural and social mores that were at variance with others and remain so to this very date in the landmass that we call today modern India. Dynasties emerged and became extinct as the fortunes changed for them. Even if they tried to create a shared culture and language amongst the inhabitants that they ruled over, such wishful projects never succeeded in creating the Indian fusion or nationalism where the local, individual, or regional cultural identity felt part of the whole. As it has happened in most parts of the world, others from outside came and ruled over the indigenous people in India. The so-called Indo-Aryans came from central Asia and imposed or tried to impose their caste-ridden monstrosity over the indigenous darker-skinned inhabitants (the so-called Dravidians) that they came across and defeated them, sealing their fates forever as the lower caste people. However, thanks to disingenuous historians and politicians, the matter of invading Aryans and their mass slaughter of the indigenous people is long lost in the political discourse. They are considered natives to India solely because of masterminding the Hindu religion that is the majority religion in this landmass of many religions, castes and creeds. Sadly, the same concession is not given to the descendants of other conquerors – Muslims and Christians – that came later. In the crafty hands of biased individuals, Indian history got divided into three or at most four periods – the pre-Muslim Hindu Era ending in the 12th century before Muslim rule of the vast territories of India, the Muslim Era that would end with English colonization of the territory in the 18th-19th centuries, and the modern India when she earned her freedom from the British Raj on August 15, 1947. There is such a nostalgia about the Indian past that myths have throttled or reshaped inglorious facts, and history is twisted to portray the Muslim period of rule of India as devastating. Consider Mr. Mukherjee's speech when he said, "Ancient travelers like Megasthenes in the 4th century B.C., Fa Hien in the 5th century A.D. and Hiuen Tsang in the 7th century AD; when they came to India, wrote about the efficient administrative systems with planned settlements and good infrastructure." Lost in his speech are some hard facts about India while eulogizing the past. Hiuen Tsang (also Xuanzang, Hsuan Tsang) was the celebrated Chinese traveler, a Buddhist monk, who visited India in Ancient Times. He is described as the “Prince of Pilgrims.” He made it to India in 630 or 633 C.E., depending on the source after about three years of travel, via western China, Central Asia and Afghanistan. His visit to India was an important event of the reign of Harshavardhana. By that time, the city of Pataliputra, which was home to the First Buddhist council immediately following the death of the Buddha and the Second Buddhist council in the reign of Ashoka, was in the ruins. Instead, Kanauj and Prayag had become important cities. His first impressions of the Hindus inhabiting northwest India were recorded as follows: "The people are weak-minded and cowardly, and they are given to deceit and treachery. In their relations with each other there is much trickery and little courtesy. These people are small in size and unpredictable in their movements." “He then gives us Indian measures of space and time, tells us about the castes of India, notes the characteristics of the people, their education, customs, products, dress (“the people have no tailoring”) in a kind of ethnographic survey." He deplored Hindu excesses such as “the Hindu who covers himself with ashes like a cat who has slept in a chimney." “His travels were not without danger... Robbers also tried to ambush his caravan in the Punjab. Pirates very nearly burned him at the stake not far from Ayodha. While on the pirate's altar, Xuanzang was able to concentrate on the figure of the Maitreya Buddha so that he lost all awareness of his surroundings. He does not report his narrow escapes to the Emperor and so we are indebted to his biographer, Hui Li, for the accounts of them." Xuanzang's accounts, predating Muslim rule, portray that the Indians, far from being united under a single nation, were divided politically and that they were still a uncultured people who had no tailors. From his discourse with Harsavardhana it is also obvious that in the latter's territory, people were heavily taxed. How would Mr. Mukherjee explain the collapse of the Indian system if it had such a flawless, efficient administrative systems and good infrastructure? The real facts are that the system was weak like a termite-eaten house, which collapsed like a deck of card with very little shaking! In his speech, Mukherjee said that while the Europeans were divided into nation states based on the concept of a defined territory, a single language, shared religion and common enemy, “India was a state long before the concept of the European Nation State gained ground after the Treaty of Westphalia in 1648” and that Indian nationalism emanated from ‘universalism.’ Again, it is an exaggerated claim and belies facts. Truly, if there was ever any universalism, then hundreds of millions of Indians would not have rejected their Sanatan dharma and chosen the faith of ‘invaders’ or ‘foreigners’. Nor would there be hundreds of millions of Dalits who are treated worse than dogs and swine in India! Despite such exaggerated claims, Mr. Mukherjee’s speech was a timely one that deserves our thanks for trying to open the chauvinist minds of the Hindutvadi fascists of the RSS towards embracing diversity and pluralism, the very trend-setters of our time.